Do you have an interest in the Metcalfe, Metcalf, Medcalfe, Medcalf, Midcalfe, Midcalf (or any other variant) amongst your ancestors? 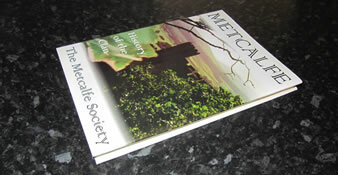 “If you have a family link in Yorkshire, somewhere in your past there will be a Metcalfe.” ... so the saying goes! 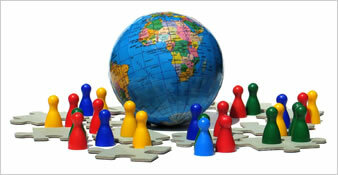 Founded in 1980, The Metcalfe Society today stands in the forefront of the world of genealogy as one of the largest and most respected one-name study groups, with over 2,000 members past and present, home and overseas. 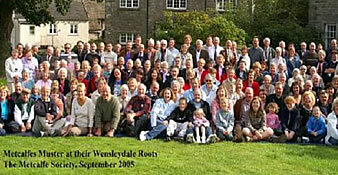 As a UK Registered Charity 1000879, The Metcalfe Society currently holds over 103,000 individual Metcalfe 'ancestors' on the constantly expanding Computer Index. The 800 year history of the name is fully researched and published, and society membership offers a free genealogical research service, member access to search records online, and an award-winning journal, with lots more. Here at The Metcalfe Society, you’ll find the relatives and ancestors you never knew you had! Find out more about the value of membership to you and how to join. So whatï¿½s in a name? ... about 800 years when it comes to the Metcalfes. ï¿½Metcalfe-History of the Clanï¿½ brings one of Yorkshireï¿½s best known families to life. The 38th Annual Mecca Muster & AGMis on Saturday 6 October 2018 at the Tennants Garden Rooms, Leyburn. Enjoy a weekend in the Yorkshire Dales & find out more! Standing at the forefront of the genealogy world as one of the largest & most respected one-name study groups, find out how we can help you.